Welcome to the Vol. 46, No. 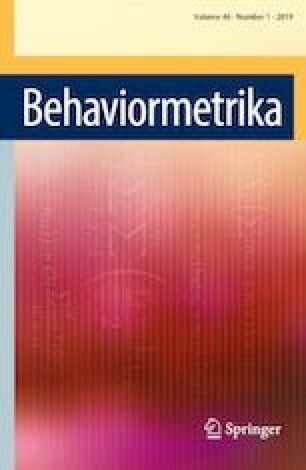 1, 2019 of Behaviormetrika. In this issue, we are happy to publish the following nine original papers and one invited paper. The first paper is “A generalized procedure for estimating the multinomial proportions in randomized response sampling using scrambling variables” by Housila P. Singh and Swarangi M. Gorey (2019). The authors have suggested a generalized randomized response procedure, for estimating the multinomial proportions of potentially sensitive attributes in survey sampling, using higher order moments of scrambling variables at the estimation stage to produce unbiased estimators. This study derived expressions for variance and covariance of the generalized estimator with its development and showed that the developed estimator is more efficient than the previous estimators. The second paper is “Bayesian analysis of happiness with individual heterogeneity” by Lei Shi and Hikaru Hasegawa (2019). This study applies a new Bayesian univariate ordered probit model to happiness data on Australia, Canada, and the United States, with immigration status and religion status reflecting individual heterogeneity in the threshold model. The empirical results show that the models including individual heterogeneity perform better than those without individual heterogeneity do. Furthermore, the effects of heterogeneity vary between the three countries. Having a religious affiliation affects the thresholds in the United States, but shows no evident effects in Canada or Australia. In addition, parents’ immigration status can affect the thresholds in Australia, but shows no effects in the United States or Canada. The third paper is “Logistic regression and Ising networks: prediction and estimation when violating lasso assumptions” by Lourens J. Waldorp, Maarten Marsman and Gunter Maris (2019). Recently, the Ising model was applied in psychology to model cooccurrences of mental disorders. It has been shown that the connections between the variables (nodes) in the Ising network can be estimated with a series of logistic regressions. This study demonstrates how well such a model predicts new observations and how well parameters of the Ising model can be estimated using logistic regressions from simulation experiments. The forth paper is “Exploring the psychometric properties of the mind-map scoring rubric” by Cheng Hua and Stefanie A. Wind (2019). This study developed a new scoring rubric for Mind Map Scoring Rubric (MMSR) using Item Response Theory (Many-Facet Rasch Modeli).The results show the effectiveness of the proposed score. The fifth paper is “Comparing two maximum likelihood algorithms for mixture Rasch models” by Yevgeniy Ptukhin and Yanyan Sheng (2019). The mixture Rasch model is gaining popularity as it allows items to perform differently across subpopulations and hence addresses the violation of the unidimensionality assumption with traditional Rasch models. This study focuses on comparing two common maximum likelihood methods for estimating such models using Monte Carlo simulations. The conditional maximum likelihood (CML) and joint maximum likelihood (JML) estimations, as implemented in three popular R packages are compared by evaluating parameter recovery and class accuracy. The results suggest that in general, CML is preferred in parameter recovery and JML is preferred in identifying the correct number of classes. The sixth paper is “Beyond p values: utilizing multiple methods to evaluate evidence” by K.D. Valentine, Erin M. Buchanan, John E. Scofield and Marshall T. Beauchamp (2019). Null hypothesis significance testing (NSHT) is cited as a threat to validity and reproducibility. Alternative procedures (i.e., Bayesian analyses and Observation Oriented Modeling: OOM) can be more powerful and meaningful to our discipline. This study examines three methodologies (NHST, Bayesian Model comparison, and OOM), then compares the possible interpretations of three analyses (ANOVA, Bayes factor, and an Ordinal Pattern analysis) in various data environments using a frequentist simulation study. The results found that changing significance thresholds had little effect on conclusions. Further, it suggests that evaluating multiple estimates as evidence of an effect allows for more robust and nuanced interpretations of results and implies the need to redefine evidentiary value and reporting practices. In addition, in this issue, one special feature were included “Functional data analysis and its applications” (Araki and Kawaguchi 2019; Misumi et al. 2019; Takagishi and Yadohisa 2019; Bouanani et al. 2019) which was edited by Gil González-Rodríguez and Hidetoshi Matsui.